Well, this tutorial has been a long time coming! Hope you all enjoy! I tried to take lots of pictures, but if anything is unclear, just let me know! This tutorial will be for a 12" zipper, but I will give you some dimensions and tips at the end to make other sizes. This tutorial is specifically designed for metal zippers. You CAN make the bag with a nylon zipper and it will work just fine. Since you can sew over nylon zippers, the zipper can actually be longer than required since you simply cut off the excess AFTER you sew the sides of the bag. However, I prefer metal zippers so I created this tutorial with the unique challenges of metal zippers in mind. While I say "pin" throughout this tutorial, using clover clips is often easier with the bulk of all the fabric layers. I buy all my zippers from Zipit on Etsy. Please check out The Plaid Scottie or Pink Stitches for two great tutorials on how to make boxy bags without exposed seams (I see no need to re-do that tutorial when there are two fabulous ones out there). That method is more involved and if you are new to pouch making, you may benefit from trying this method first. Just saying! Also, Bonnie's (pinkxstitches) tutorial will explain how to add a carrying handle to your boxy bag if you want to try that! Exterior fabric for tabs 4"x7"
*****If using a directional print, the top of the print should be the 13.5" side. 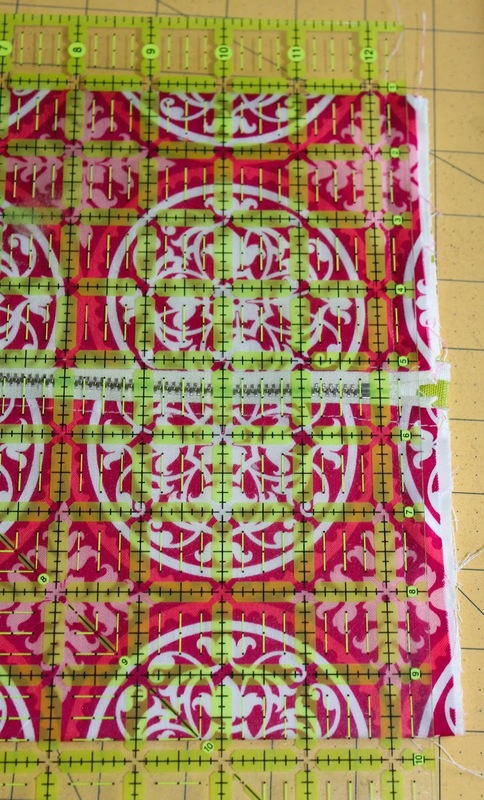 If you want the print to look correct from both sides of the zipper (and not right on one side and upside down on the other), cut two pieces of exterior fabric 13.5"x 8.75" then sew them together with a 1/4" seam allowance so that the print is facing the right way along both 13.5" sides. I know this can be confusing. I'll try an post a picture of what I mean soon! I highly suggest you play around with various types of interfacing/fabric combinations to see what you like best. Interfacing will determine the shape and weight of your bag so it's very important! The two most common ways I interface are with two layers of Pellon SF 101 (shape flex) on my exterior, or with batting and a quilted exterior. These are not the only methods! If this is your first time making a pouch and/or you have no experience with interfacing, try two layers of Pellon SF101, it's simple and will give your bag some shape without adding bulk. The thing to keep in mind about adding batting or fleece is that it will add bulk around your zipper. This is really only a concern for newbies. I don't want to make your life harder so I simply suggest you try the easiest way first before you graduate to methods that could potentially cause you more trouble. As for duck cloth, I have had success using duck cloth in between my exterior and lining fabrics to give a lot more heft to quilting cottons. Duck cloth can be trickier to use since it add a third, shiftable layer to the pouch. Not impossible to work with, but newbies, please beware. Also, depending on the exterior fabric you use, you may not even need interfacing. I've made pouches using a heavy gold vinyl (see pictures below) and I do not use ANY interfacing with those! So always be aware of your starting materials. Heavier weight fabrics will not require the same level of interfacing as quilting cottons and some fabrics cannot be ironed. Know your fabric! Know your interfacing! Don't be afraid to experiment! After you cut your fabrics, interface them as desired. The pouch pictured has two layers of Pellon SF 101 on the exterior (green) fabric. Open it up and fold the ends in toward the center crease. I do not fold them all the way to the middle. This is just a personal preference. Refold along the center crease to give you an approximately 1"x7" piece. Topstitch along either side. Cut in half to get two 1"x3.5" pieces. These will be your tab pulls. These are very helpful for this type of pouch when you try to open and close it. Trust me, I've made some without them and I often struggle to get them open! Now it's time to make a zipper sandwich. This is how I attach zippers, but it's not the only way. Guess what though? You're on my blog so we're doing it my way. :) Place your lining fabric right side up. Place your zipper right side up--this means that you should be able to see the zipper pull! Don't mess this part up! Make SURE you can see the zipper pull! Place the exterior fabric right side DOWN. Using your zipper foot attachment, sew the layers together using a ¼” seam allowance. DO NOT SEW the area where the zipper pull is. Stop before you get to the pull. Then pull the zipper pull down past the area you have already sewn and resume sewing your zipper sandwich where you left off. This makes it easier and yields cleaner, more even results along your zipper. Depending on which way you oriented your zipper when making the first zipper sandwich, your zipper pull may be on top first. If that is the case, just start a bit below the zipper pull with your 1/4" seam and go to the end of the zipper. Once you're done, unzip it and start back at the beginning. I do no back stitch when I do this, I simply so back over some of my stitches when I restart my stitching. If you feel more comfortable backstitching when you pause during the zipper attachment, go for it! Top stitch about 1/8" away from the edge of the exterior fabric. This gives your pouch a more finished look and holds all the layers together so nothing gets caught in your zipper. Now repeat the previous steps to attach the zipper to the other size of the lining and exterior. Layer the lining right side up, the zipper right side up and the exterior fabric right side down. Here's another view of what your sandwich should look like the second time around. See how I started sewing below where the zipper pull was this time? I then go back, unzip the zipper and sew over the beginning bit I skipped. This really is the best tip I can give you with metal zippers! You want your seam allowance to be consistent when attaching the layers to the zipper tape and that can get tricky with metal zippers. You've been warned! Again, press your exterior and lining fabric away from the zipper. Top stitching the second side can be challenging. Go slow and gently fold the rest of your pouch back and out of your way to your needle can make it all the way to the end. See how I've folded the pouch over during the top stitching process? Turn your pouch wrong (lining) side out and then flatten the pouch so that the zipper is centered on top and the exterior sides are facing. I don't give exact measurements here because it can very depending on the type of fabric and interfacing you use. Feel free to get out your ruler and make sure the zipper is centered. I typically eye ball it. If you have a directional print and have cut two exterior pieces, you have a natural guide line as to the center with the seam in your exterior. Line up the seam with the zipper and you're golden! 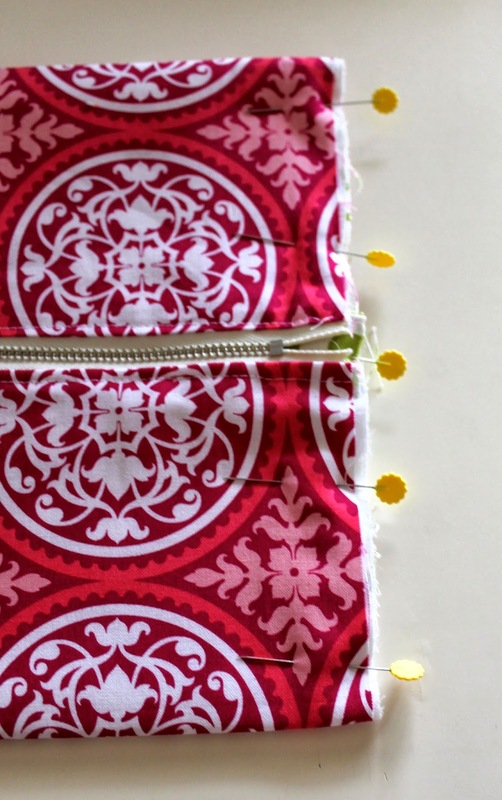 Fold your 1”x3.5” tabs in half and insert them in between the exterior sides, centered at each side of the zipper. If you don't accurately center the tab, you're going to notice it when the pouch is done (ask me how I know). Learn from my mistakes people! Take your time and center the tab! The raw edges of the tabs should be lined up with the raw edges of the flattened pouch. Pin the raw edges. Repeat for the other side of the pouch. Using a 5/8" seam allowance, sew along the sides of the flattened pouch. NEVER SEW OVER THE METAL ZIPPER!!!!!!! If you've followed all the previous instructions, your needle should pass near, but not over the actual zipper. You should only be sewing through the zipper tape. Using a rotary cutter and ruler, trim the seam allowance on the sides down to 1/4"
Measuring 1.75" from the STITCH LINE. Let me repeat that, from the STITCH LINE, not the edge of the pouch. Draw and cut a 1.75" square from each corner of the pouch. The piece should actually measure 1.75"x2" since one side will have the 1/4 seam allowance. Please read and re-read this instruction carefully. If you fail to do this step correctly, your corners will not box neatly. Use good scissors or a small rotary cutter here to keep the cutting lines clean and your work neater. Using a thread that coordinates with your lining, sew a tight zig zag (serge) over the exposed side seams to tidy them up and keep them from fraying. I usually go over them twice with a stitch length of .7 and a width of 6. I have a Babylock Symphony and not all settings are the same so know your machine! You do NOT want to try and satin stitch over this. It is pretty thick around the zipper tabs and that tight stitch is difficult for most machines. Better to do a slightly looser zig zag and go over it twice. Then trim any small loose threads that remain. Take your time with this step to keep your work clean. Matching the thread you use in this step with your lining will keep the exposed seams from being as noticeable when your pouch is done. Box all four corners by opening each corner, centering the side seam, flattening the zig-zagged side seam AWAY FROM THE ZIPPER (toward the bottom of the bag), and forming a straight line. Pin in place. Using a 1/4" seam allowance, sew each of the four boxed corners closed. Using the same method described above, zigzag all four corners and trim excess threads. Flip the bag right side out through the opening left in the zipper. Yay! You're done! Below are some more examples of finished pouches! For 14" zippers, I cut my fabric 15.5"x18" and use the same measurements for boxing the corners as I did with my 12" zipper. For 9" zippers, I cut my fabric 10.5"x15" and boxy my corners at 1.25" to 1.5"
I always cut my fabric width the length of the zipper TAPE not the length of the zipper. so my 12" zippers have a 13.5" tape, the 14" zippers have a 15.5" tape, and the 9" zippers have a 10.5" tape. So can you see how I get the first measurement for my fabric? Easy peasy! The second measurement you can vary to get a different look. Feel free to experiment with different size zippers, different length fabrics, and different size boxed corners to make your pouch uniquely you!!!! Thank you very much for this tutorial! I want to make a gift for a friend, and this is just right i think! that is seriously soooo creative!! so impressed! I want. Loved the class and seeing all the bags together. Thanks for sharing! wait... so when am I supposed to unzip the zipper? j/k! great tute! Fabulous tutorial Kelly, and it gave me a much better idea of neat zipper sewing than some others I've seen. I'm going to make one! I might even make more than one! Oh Kelby! Thank you for this! I have been admiring your boxy pouches for such a long time, and it's awesome that you were willing to share the pattern with us. I can't wait to make a couple - for me, and it's perfect for gift-giving. Thank you SO very much! thanks! You know...should I unzip my zipper at some point??? HA! Just kidding! That is the BEST advice, and guess how I know that??? Looking forward to using your well written and photographed tute! Thanks! Sue. I have made two bags so far. One is off in the mail today filled with Seattle treats for my Montana friend. Super simple and fun pattern! I agree with Melissa. You made this look so easy I just might be able to get over my fear of 3D sewing! Thanks for the great tutorial! Best Instructions and pictures EVER!! Where do you buy all your fabric from? It's lovely! I'm in the UK so it may be no use for me though. It's hard to find cool home dec weight fabric! Thanks for the lovely tutorial. You're so smart to stress opening the supra, and also centering the tab. I've made both mistakes myself. As far as centering the tab, I find a zero centering ruler extremely helpful here. I use it for all kinds of sewing tasks when I need The exact center marked. P.S. Oops. I meant "opening the zipper," not "opening the supra." Lol. Voice recognition is good, but it's not perfect. I've been wanting to sew a makeup bag for over a year. Tonight I found this tutorial on pinterest and made one right away. Even with 7 kids plus 2 more friends sleeping over I managed to sew up the entire thing this evening. I used a 14" zipper, cotton duck toile, and some "too light" interfacing I had on hand. It turned out great. The tutorial is superb. Thank you. I'm planning on making my boys camo boxy bags next. You have helped me through my first item with zipper. And it went great. Your tutorial is excellent. Thanks a lot!! What are thoughts about binding the raw edges like a keykalou dumpling, instead of zigzag? Too much bulk? Thank you thank you thank you. This was one of the easiest pouches I ever made. You are a genius to make it so simple. Well done! I made the mistake of starting with 2 pieces of each and had to moderate, but your instructions and tips were great! I can't wait to try this out! Anyone know the finished bag dimensions? I want to make this immediately. What a special gift this would make for a ... sister, or another beloved friend. Your tutorial is perfectly written. Hi, you mentioned to experiment with the sized of the boxed corners. If this is right in my head...smaller boxed corners make shorter boxes, right? Thanks for a great tutorial, going off to make six of these for friends! Great tutorial, thanks so much!!! Hi, I just made your box bag and I have to say, your instructions were GREAT! Thank you for sharing! Very cute bag. The tutorial is very clear and useful also. Thank you for this. Trying to follow your blog but GFC won't work properly. Will keep trying. Oh......love! I have been wanting a boxy bag this size with lining.......ty! Hi Kelby!, Thanks so much for this incredible tutorial! My question is....is it possible to use pink stitches strap technique with your pouch design? I've been looking at both patterns for ages and I cant figure out if I can and I only have one zip to try lol! When you are at the 'cutting small corners out from edge' stage in this pattern, can you just add the handles then as well? Hope that makes sense! Thanks for any help you can give!! Purchase online Customized cotton bag, canvas bags, can print on customized design or logo from the BagsTalk at very genuine and affordable price. Gr8 to see your articales which is written will hape you had spend lot of time to write such a nice blog post about Custom Cotton Bag handmade we also know about some website wich also provide the same..
BagsTalk is one of the best professional product suppliers of the best quality and genuine Cotton Bag Custom Print and Custom Print Cotton Bag. These genuine bags can be easily online shop from the site. I promise that we will give you best satisfaction in the quality product of Cotton Bag Custom Print and Custom Print Cotton Bag. I was wondering the same thing, only I thought smaller corners made a taller bag. Which is it? thanks for sharing useful tutorial with us .. ! Thank you for posting such a great tutorial. a great size and perfect shape. I’ve looked at other tutorials for this bag-type and yours is the best so far! Very clear pictures! I’ve been sewing since I was in Elementsry school but couldn’t wrap my head around how to make one of these in my head, ha! Muito linda vou tentar fazer! Sera que da pra fazer no manual mesmo? Pois nao tenho a maquina dr costura.